Fantastic Journey may well describe the life the late Paul Roads, founder of Wonderland Park, in Amarillo, Texas. Paul's adventure started on Oct. 10, 1918, near Augusta, Kansas. In his younger years, the path took him to Cessna Welding School to learn a trade working for Cessna as a welder and machinist, two skills that would eventually prove useful in his later pursuits. 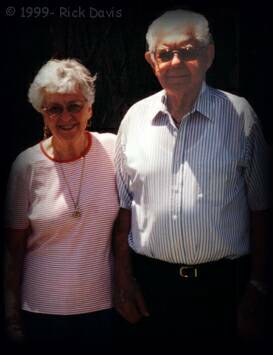 While living in Wichita, KS he met and married Alethea and they had two children, Paula and Danny. A detour in his life-long journey took him to Arizona where he started an ice-cream business. About a year later, Roy and Hazel Neff, his brother-in-law and sister asked Paul to leave Arizona to help develop an amusement park in San Angelo, TX, which would inspire a dream in the then 32-year-old man: He wanted to have his own amusement park. In 1951 the family moved to Amarillo, TX where Paul took a job as a welder at Amarillo Air Force Base. Although he was working a full time job, he was committed to pursuing his vision. Kiddie Land opened on August 12, 1951, with three small kiddie rides: a boat ride, a kiddie car ride and the Little Dipper roller coaster. Paul put some of his skills to use by building one of the rides himself. With help from his in-laws, Robert and Ruth Mikesell, he operated the park while continuing to work his day job. For ten years he would work eight hours a day at that full time job, while he would go to work at the park in his "spare" time. In 1958 Paul's doctor finally advised him to make a choice between the two. Fortunately for us, he chose the park. Around 1960 he started adding adult rides and renamed the park Wonderland, inspired by "Through the Looking Glass". Since then, the park has continued to add or replace about one ride per year. 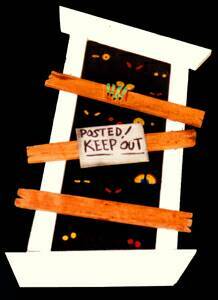 Our interest begins about 25 years ago with the addition of the Fantastic Journey dark ride. 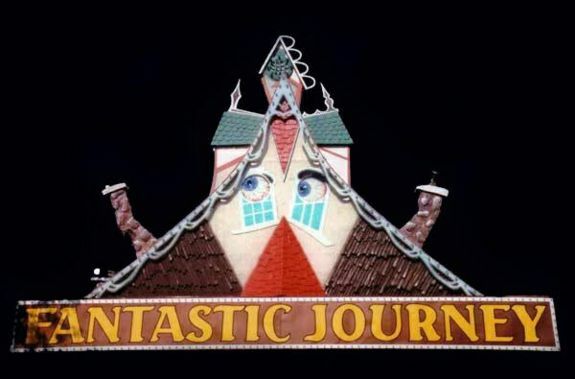 The name Fantastic Journey is an appropriate name in that the story of its creation spans the distance between California and Indiana and beyond. It is a tale that has at its heart the friendships that have developed between the owners of many of the small, family parks. The Roads, Stan Nelson (Joyland in Kansas), Bob Bell (Bell's Amusement Park in Oklahoma), Tom Spackman (Indiana Beach in Indiana), and Paul Nelson (Waldameer Park in Pennsylvania) are just a few that have enjoyed long lasting friendships. This camaraderie has lent itself to years of sharing ideas and resources between the parks. When Paul decided he needed a dark ride, one of the first places he went to do research was California. One of the rides that he inspected was severely vandalized, but he still came away from it with two good ideas. The first was a plan to build a rotating barrel. He measured, sketched, and photographed the one he saw, and then built his own. Paul's attention to detail resulted in his barrel working while some built by other parks were plagued with problems and were eventually removed. The second was a plan to prevent the same type of damage from occurring in his ride. He realized that most of the vandalism occurred from riders that got bored after riding several times and then decided to get out of the car and wander around. His decision was that his dark ride would not be included in the pay-one-price plan. Individual tickets would be required for each ride. Of course, putting fence in front of the tricks would help too. 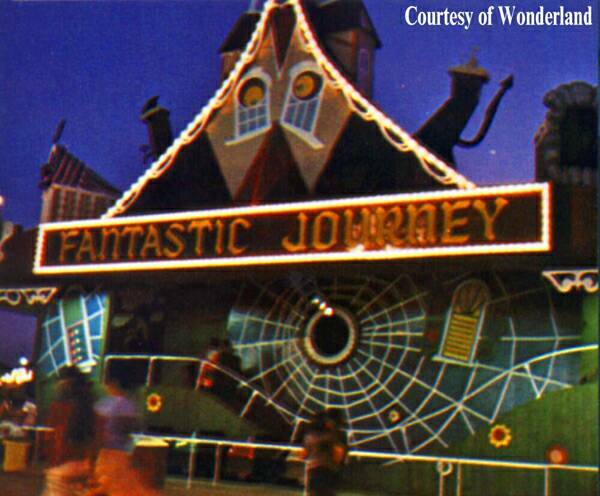 Although it may look like a Tracy built Wacky Shack, the idea for Fantastic Journey was actually borrowed from Bell's Amusement Park. Again armed with a pencil, measuring tape, and a camera he drew up his own plans. The ride front was built at Wonderland in its shop. Unlike the proverbial man who built a boat in the basement that was to big to fit through the door, Paul thought ahead built the front, lying down, in four-foot sections. When two sections were completed he would remove one, take it outside, and start the next. When they were all finished it was a simple matter of bolting the sections together. If you look closely at the ride front, you can see where the seams are. Paul then turned his attention to the inside of the ride. He spent many 100-degree days inside the sauna that was to be a dark ride with a torch and jigs bending the rail that would guide the cars. In fact, he spent so much time building the Fantastic Journey (9 months) that some of the newly hired employees didn't know who he was! Gags for the ride were next on the list, including the rotating barrel which was built next to the shop. 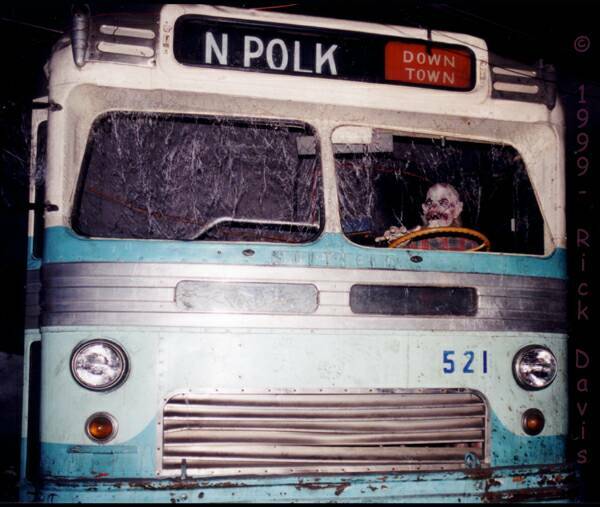 One classic gag in this ride is the oncoming bus, an idea that Paul borrowed from Indiana Beach, which actually used the front of a Mack truck. When Bob Bell saw it, he wished that he had one for his Phantasmagoria ride. Paul replied, "Come back in two weeks and I'll have one for you!" He had a friend that had several more that he could cut up. The water curtain gag at the end of the ride was copied from Bell's and built in house. 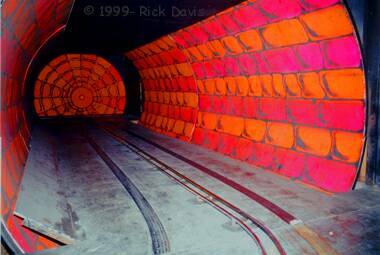 Although most of the ride was made in house, Wonderland did have Henri Pohl of International Amusements design and install about 7 gags in the ride. Bell's Amusement Park constructed the cars for the ride, another example of the sharing of resources between the parks. The ride which uses eight cars, no more, no less, in operation with a few spares in storage. That number was chosen specifically to allow the maximum number of riders and still ensure that each scene remains a surprise to the following rider. No one wants the effect to be ruined by seeing the car in front of theirs activate the trick before they get to it. One of the few changes to the ride occurred a few years ago; the two dips were removed. Like their friends at Bell's and Joyland, Wonderland tired of debris in the dips slowing or stopping the cars before the top of the hill. The four and a half-minute ride on the Fantastic Journey certainly lives up to its name. 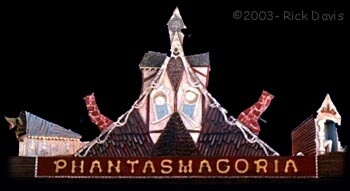 This is one of the best classic dark rides that you may ever have the pleasure of riding. The tricks work flawlessly (a rarity today at most parks), its condition is very good, and the quality of the experience is, well, fantastic! It is likely one of the top traditional darkrides in the country. Alethea Roads, her daughter Paula and her son-in-law Paul Borchardt, and the rest of the staff of Wonderland are great people with a knack for making you feel that you are an old friend. When you tire of the excruciatingly long lines at the big theme parks, it may be time to relax and experience some old-fashioned family park fun. A pleasant experience and a great dark ride await you at Wonderland. Paul Roads, founder of Wonderland Amusement Park, died Wednesday, May 7, 2003. He was 84 and is greatly missed by his family and amusement park fans everywhere.